James P. DeSantis has more than 27 years of research, program design, evaluation, technical assistance, and project management experience. His subject expertise includes child welfare, child and adolescent development, capacity building, organizational and systems change, prevention services, Head Start and Early Head Start, comprehensive two-generation family support programs, and integration and coordination of services across program areas. DeSantis is the project director for the Evaluation of the Capacity Building Collaborative, a 5-year evaluation funded by the Administration for Children and Families (ACF). He is the corporate supervisor and monitor for several other ACF projects, including Understanding Judicial Decision-Making and Hearing Quality in Child Welfare, Prenatal Alcohol and Other Drug Exposures in Child Welfare, and Evaluation Technical Assistance for Title IV-E Waiver Demonstrations. 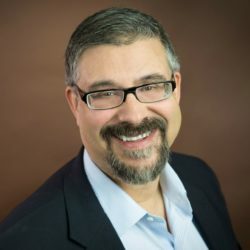 He also serves as corporate supervisor for Trauma-Informed Care: Connecting Research, Policy, and Practice to Build Resilience in Children and Families for the Office of the Assistant Secretary for Planning and Evaluation. DeSantis has directed other large-scale research and evaluation projects at JBA, including the Cross-Site Evaluation of Child Welfare Implementation Centers and National Resource Centers. He served as project director, and later as corporate monitor, for two projects: Technical Assistance on Evaluation for Children’s Bureau Discretionary Grant Programs (for which he continues to serve as corporate monitor) and the Adaptable Evaluation Training and Technical Assistance for Healthy Marriage, Promoting Responsible Fatherhood, and Tribal/Temporary Assistance for Needy Families Child Welfare Grantees. He was also corporate supervisor for the National Cross-Site Evaluation of the Replication of Demonstrated Effective Prevention Programs. As project director for the Evaluation Technical Assistance and Cross-Site Evaluation of Early Head Start/Child Welfare Services Demonstration Grants, he managed technical assistance advisors; helped develop evaluation tools, resources, and reports; and presented findings at conferences and briefings for the Administration on Children, Youth and Families commissioner and Federal Interagency Workgroup on Child Abuse and Neglect. DeSantis received a Ph.D. in developmental psychology from Catholic University of America.